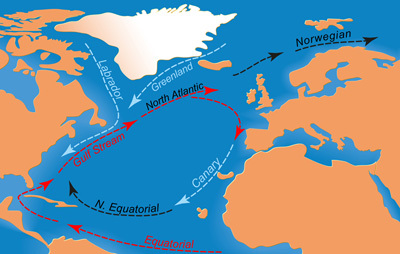 The Arctic Ocean is the biggest marginal sea of ​​the Atlantic Ocean, with which it is connected via the narrow Greenland Sea between Greenland and Spitzbergen. Approximately 80% of the inflowing and outflowing water is exchanged via this deep-sea connection. A small portion of the Arctic water also flows southwards via the Labrador Current west of Greenland. The connection to the Pacific Ocean via the narrow and shallow Bering Strait contributes less than 20% to water exchange. Despite these connections the Arctic Ocean is a largely enclosed sea with its own characteristics. The surface currents follow two major systems. On the Canadian side the water rotates slowly in a clockwise direction but in contrast, off the Eurasian coast, it flows in a wide arc from the Chukchi Sea to the Greenland Sea. Both currents have for thousands of years ensured that the Arctic ice drifts incessantly in a gigantic circular flow through the Arctic. However, the ice does not only circulate, but also expands and shrinks in the rhythm of the polar year. During the freezing-cold winter the ice crust expands and becomes thicker, and then in late summer its size decreases again. This dynamic still exists today but it is changing visibly. For 35 years, satellites in space have tracked the pulsation of the Arctic Sea ice and almost every year they have registered new negative records. The ice is still there, but during the winter its area grows less and less. And in summer it shrinks at a much greater rate than years ago. The dynamic of many of the processes that are connected to the Arctic ice is changing more and more and increasing in speed. The global warming associated with climate change makes the Arctic ice crust, glaciers and permafrost shrink. It increases evaporation, heats the atmosphere and contributes to more dangerous UVB radiation penetrating the ozone layer. And all of this in a region of our planet that is regarded as particularly sensitive and prone to disturbances. Although we are only at the beginning of this development the first signs are already evident. In the last three decades spring warming in Alaska began earlier, winters in Scandinavia have tended to be warmer, and all around the pole the tundra regions are expanding northwards. Some forecasts are not sufficiently firm and contestable since the database for comparisons barely dates back more than 50 years, but with every year in which this trend perpetuates the last doubts vanish a bit more. If the Arctic ice crust does melt in the coming decades it would alter the heat balance of the northern hemisphere and the rest of the world in a very profound way. Large oceanic currents like the Gulf Stream, which serves as a “heat pump” for Northern and Central Europe and significantly influences our climate, would be weakened and modified in their course. The consequences for man and nature would be dramatic, although by no means every change is predictable right down to the smallest detail. Compared to the other resources and opportunities that the Arctic region offers to ​​potential users, however, fishing is only of secondary importance. The region is rich in valuable raw materials which industries worldwide strive for: metal ores, gold and diamonds, but especially fossil fuels such as oil and gas. According to the US Geological Survey 14 billion cubic metres of petroleum are believed to exist in the Arctic; that would be about one-tenth of the remaining global reserves. There are also an additional 47 trillion cubic metres of natural gas, which due to the melting of Arctic ice are suddenly accessible as a resource. But even without the Arctic ice, it is still extremely difficult and expensive to explore and extract these treasures from the polar region. The extreme cold and the harsh climate, metre-high waves and the months of darkness in winter make the development of this area a risky and costly adventure. Especially as the development areas are often far away from the coasts outside the 200 mile zones in which the bordering states have exclusive rights to the resources there. 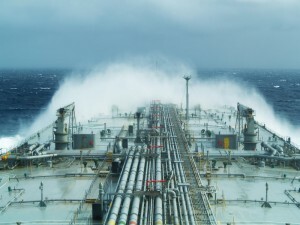 This leads to a further problem, because oil, gas and other raw materials have eventually to be transported ashore. 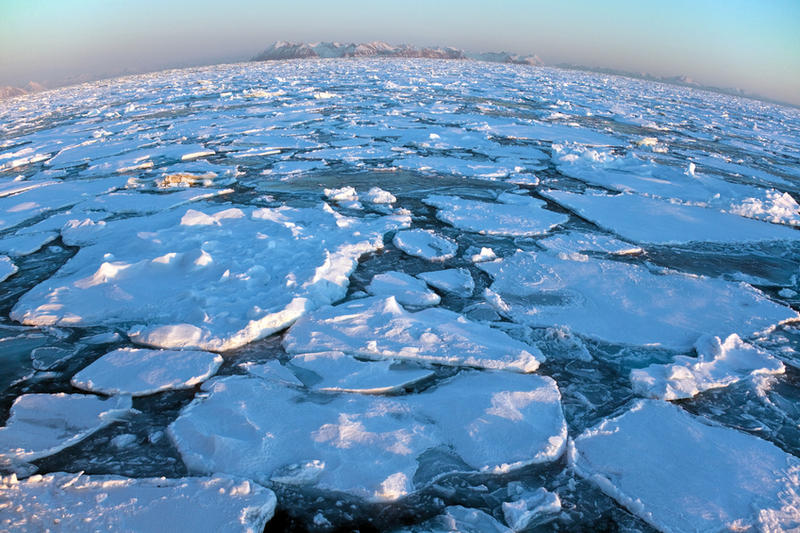 Environmental protection requirements are high to avoid endangerment of the fragile ecosystem of the Arctic. As the Arctic ice recedes, the Northwest Passage through the Arctic north of the United States and Canada as well as the Northeast Passage off Russia moves into the realm of possibility for shipping. Both routes through the Arctic do not only shorten the distances and travel times but also save fuel and costs. The sea route from the Barents Sea to the Bering Strait through Arctic waters is shorter by two thirds than the passage through the Suez Canal and around southern Asia. The dispute over the rights to use the Arctic is getting heated because virtually all the bordering states from Alaska (USA) and Canada to Greenland (DK), Iceland, Norway and Russia raise claims to the territory. In the face of the growing threats it is a more than encouraging sign that commercial fishing is banned in this area and countries cooperate more closely in the field of fisheries research. Without the ban on fishing the Arctic ecosystem might have suffered irreversible damages before basic information on the occurrence, structure and migration patterns of fish stocks becomes available. If you are interested in finding out more about human activities at sea, then the EMODnet Human Activities portal is a good place to start. The site provides the ability to view, query and download geographic data and related attributes related to many activities including hydrocarbon extraction and fishing. The primary goal of the site is to create a single entry point for geographic data on the spatial extent and intensity of human activities at sea across all EU sea-basins.